Guys, this is a special recipe! It is 1) quick and easy to make, 2) is healthy, and 3) tastes amazing! 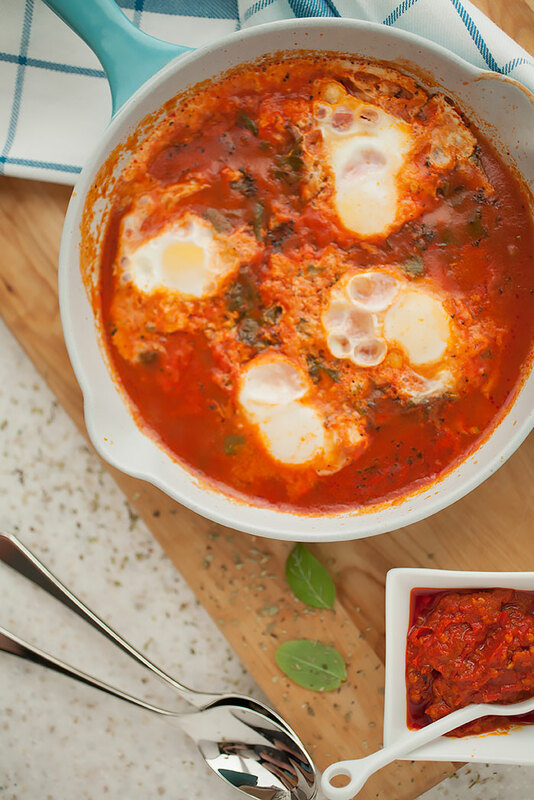 Silky, just-set eggs nestled in a savory tomato sauce (with a little spice, if you like), with some wilted greens and Parmesan melted and just beginning to brown on top—it’s heaven! And you can also have these savory baked eggs for breakfast, lunch, and dinner! 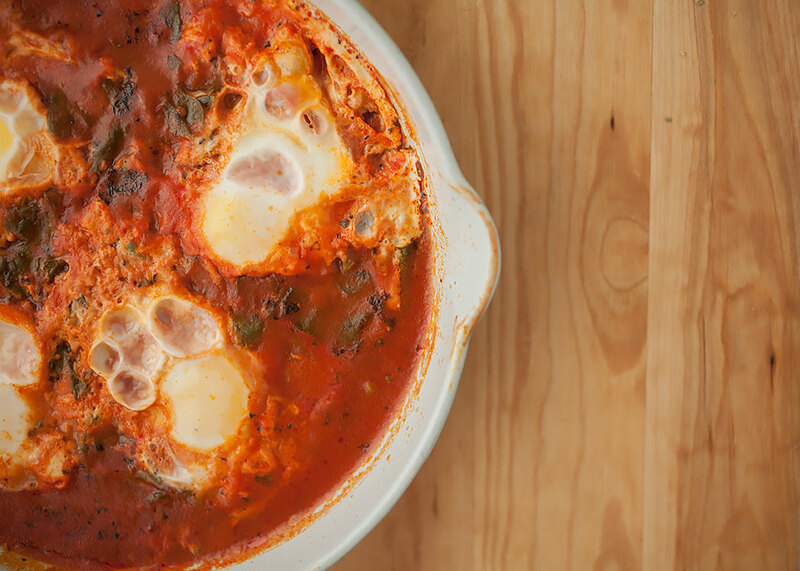 This recipe for baked eggs was my absolute staple in college. It was cheap, quick, easy, healthy and warming, especially on those gray, cold, windy and rainy Seattle days when I would have to wait for the bus, huddling under the bus stop. It’s one of my go-to comfort food recipes. You can also eat the eggs as they are, or you could serve it over a slice of good toasted bread (think thick slice of a boule or Italian peasant bread). Or, the other night, because I had been testing recipes and that became our dinner, we even had it over spiral gluten-free noodles, which was delicious! It’s also a short-cut recipe, and by that I mean you start with a tomato sauce you have on hand. I had a jar of basil tomato sauce from Trader Joe’s, but you could use your favorite tomato sauce in a jar, a sauce you froze for later, a spicy sauce, a meat sauce—anything! I also always throw in some easy-to-wilt green or some cooked veggies to up the healthy factor. Spinach is my usual go-to because you throw in two handfuls in at the beginning and by the time the eggs are done, the spinach is fully wilted. Already-cooked veggies added at the beginning of cooking also warm up by the time the eggs are done. You can also add spice if you like. We love spicy food in our house, so, of course, I made this spicy the last time I made it. You can start with a spicy tomato sauce, or add some pepper flakes or red chile powder, or you can add a sauce like tobacco or, and this is what I used last time, harissa paste (which I guess makes it a lot like shakshuka… but oh well). How much you use it up to you and your love of/tolerance to heat, so I did not include measurements in the recipe box below. Finally, feel free to add any herbs or spices you desire. I usually don’t because the tomato sauce probably is quite spiced, but you can certainly add dried or fresh basil, dried or fresh Italian herbs, etc. As always, look for a few allergy- and sensitivity-friendly swaps after the recipe box! 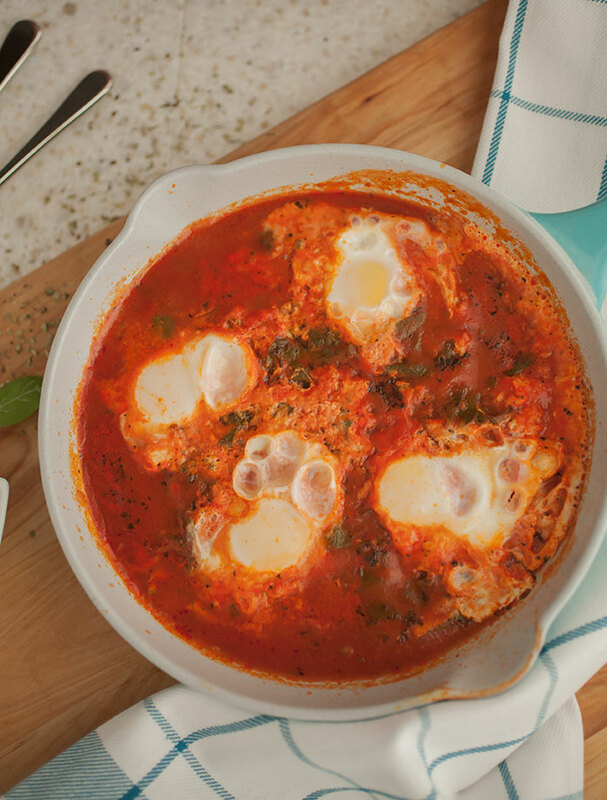 Silky, just-set eggs nestled in a savory tomato sauce with some wilted greens and Parmesan melted and just beginning to brown on top—it’s heaven! 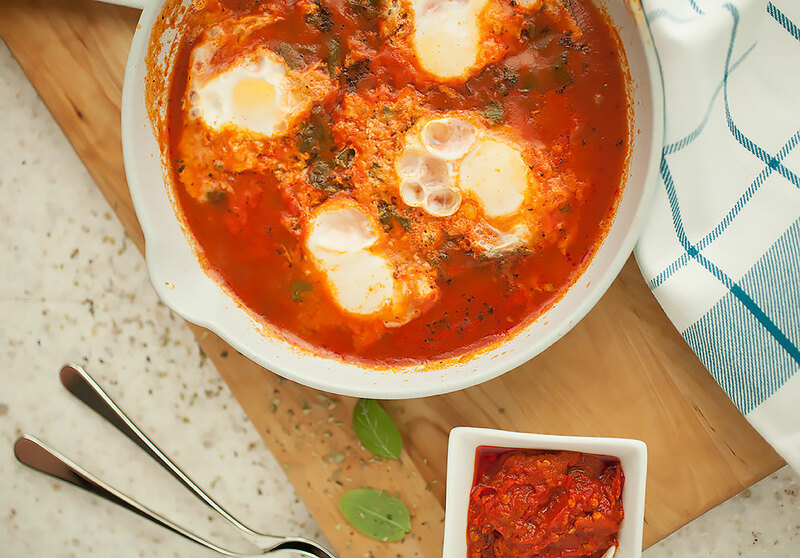 And because this recipe takes only 20 minutes, you can have these savory baked eggs for breakfast, lunch, and dinner! Pour the tomato sauce into a small pan on medium-low to medium heat. Add the veggies and the spice of choice, if adding. 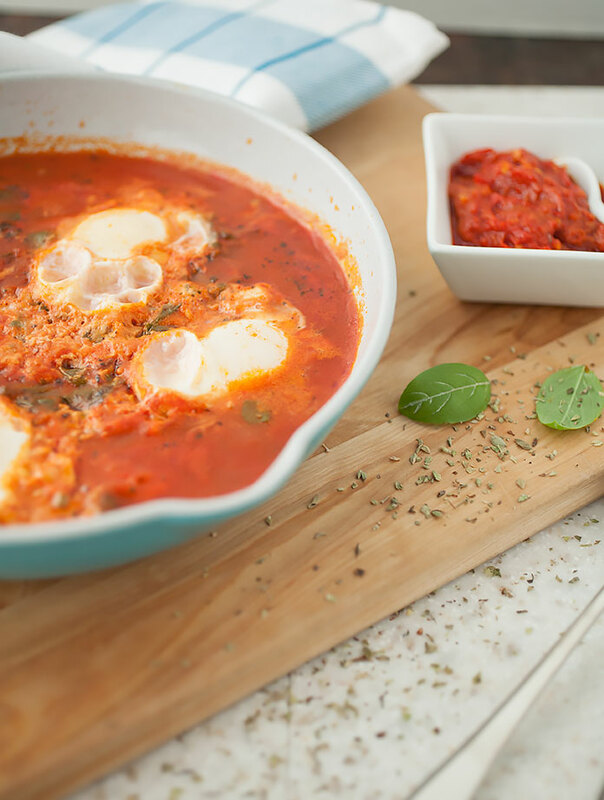 When the sauce is bubbling slightly, make four little wells in the sauce (it’s okay if the sauce is too watery and you can’t create wells…) and crack an egg into each well, then cover the eggs and sauce with cheese, if you want cheese. Let the eggs cook, uncovered, for five minutes, then turn off the heat and cover the pan. Let sit for another 3 to five minutes, depending on how done you want the egg yolks. Serve either alone or over toasted bread or noodles, depending on your preferences. This is such a perfect, light, easy meal, perfect for college students and busy adults alike!